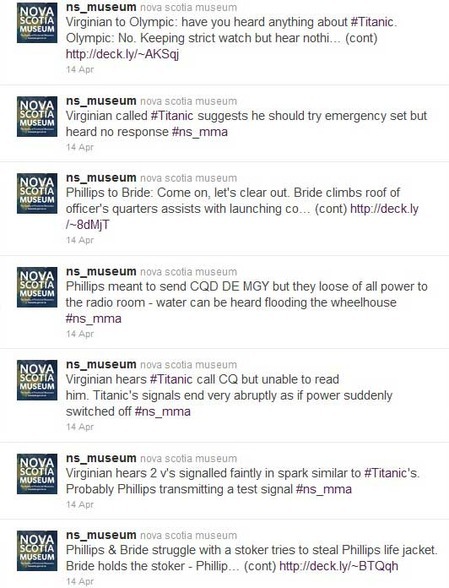 A couple of days ago, the Nova Scotia Museum in Halifax, which holds most of the surviving artifacts of the ill-fated RMS Titanic, recreated the morse code radio distress messages as “real time” Tweets, exact minute by minute, almost a century later. 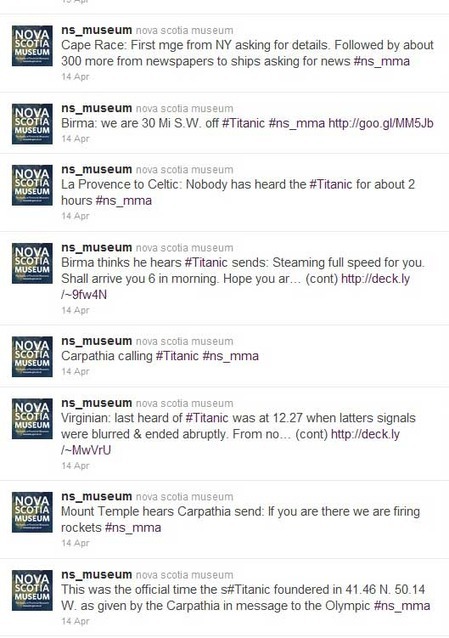 The museum’s idea was certainly an imaginative way of using Twitter in 2011. The event has three lessons on the future of news. 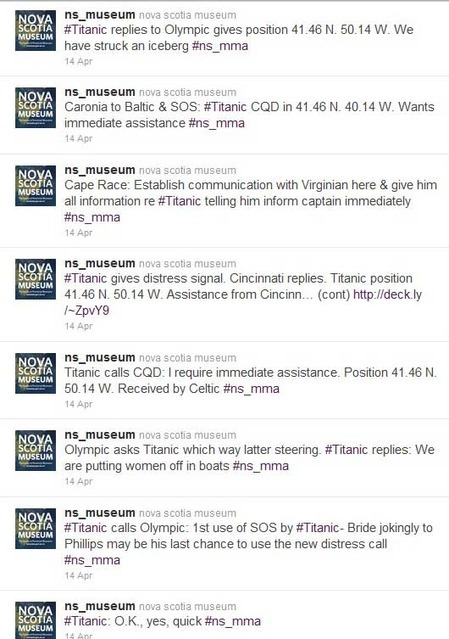 First, the Titanic recreation mirrors the way news organizations and individuals today tweet in real time for breaking news. 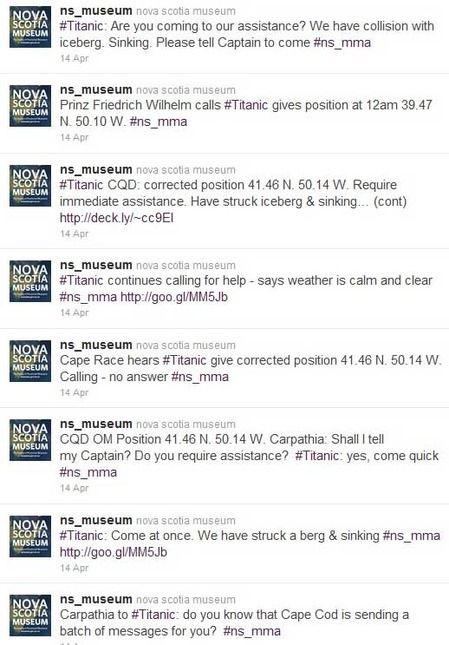 Second while a news organization might have had the idea to do something similar, using the files in its morgue (that is if the beancounters haven’t discarded the archive or donated it for tax reasons to a local library or university), it was the museum that created this Twitter event, That shows again that news organizations are in stiff competition, not only with other news media and the bloggers and social media but with any organization with the imagination to do something about a news pegged historic event. 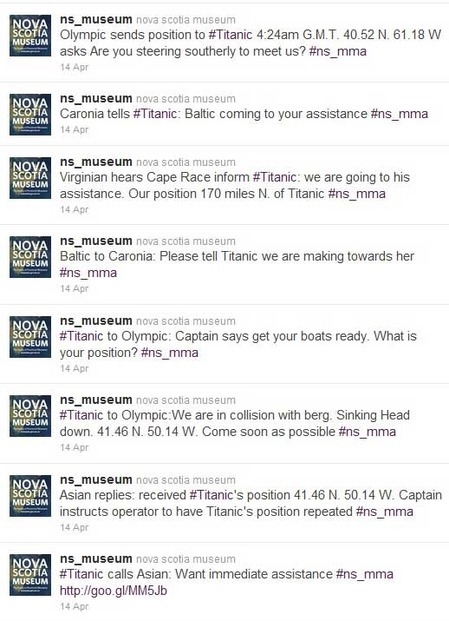 Third, this was a great news and social media story that the news media didn’t pick up. 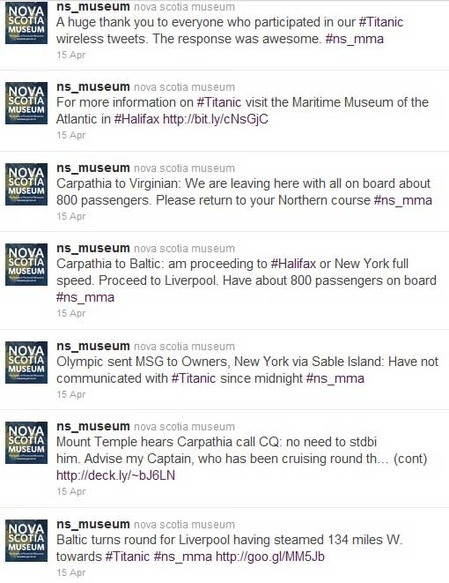 The only story I saw was an advancer from CBC.ca that I saw after the fact and so I missed the tweets. 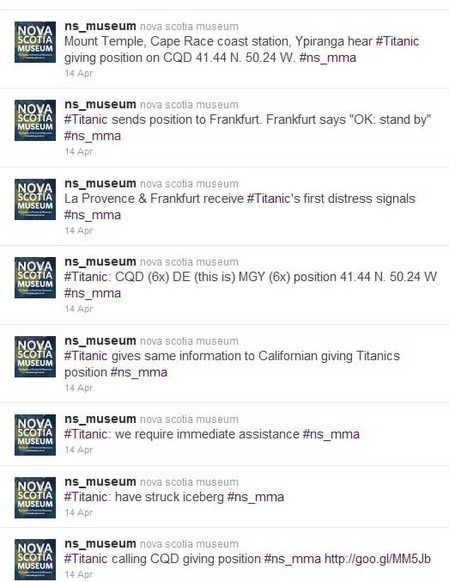 The reaction to those who know about the Tweets and retweeted or commented to #ns_mma or #Titanic were very engaged in the real time story. The media missed this one,. 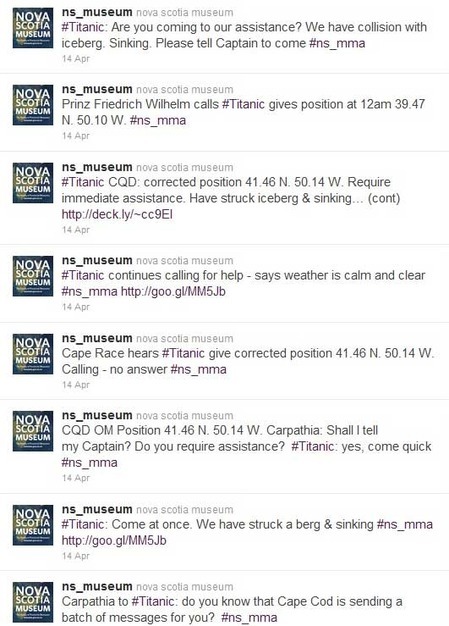 In this sequence, about half way down, the news media becomes aware of the sinking and starts asking the overworked radio operators at Cape Race in Newfoundland for details. * There is huge growth potential in increasing engagement. people, more value, more engagement equals more value to extract. 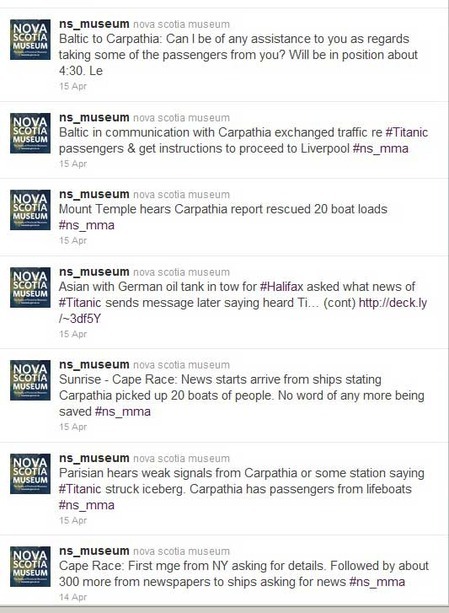 The Nova Scotia Museum’s Titanic recreation is one example, as I said, where imagination does create reader/audience engagement. The news media, however, following tired standard operating procedures and so the news media failed. In this case,. following and reporting on this story would have cost just pennies and increased reader engagement on a news story that has fascinated for 99 years. If someone, and that someone is me, can spend almost of all of a thirty year journalism career in what’s still being called “new media” and then take early retirement, isn’t it time we started calling the silicon-based multimedia something else? The word “new” in “new media” has become a slogan, no different from a consumer product such as shampoo where there always is a “new and improved”version with a tweak here and a thunk there. “New” is part of the problem, “new” is the reason why most media executives have failed to come to grips with the current crisis of falling revenues, dwindling audience and distrust of our work. Those transnational media managers, editors and executive producers are all under the impression that all they have to do is hire yet another consultant to find the right bottle for the new formula shampoo and all will be well. After a decade of that kind of stumbling, it can definitely be said that’s wrong. 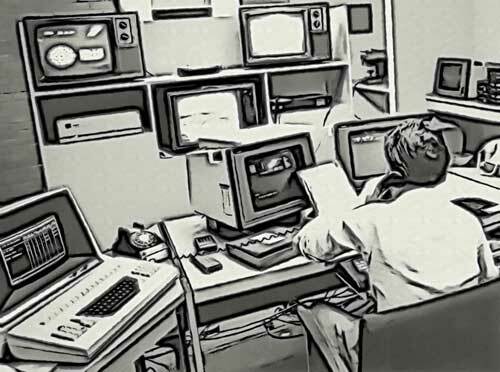 From the perspective of being part of thirty years of technological innovation, challenges, responses, successes and failures, if the new media is to survive and thrive, a different (not new) perspective is needed. Change the word, change the perception, change the response. We are living in the era of evolving media. If we stop thinking that the latest innovation (today it is the iPad and competing tablets, tomorrow who knows what it will be) as a new toy, but as new (or even invasive) species in the media ecosystem, then, uncomfortable as it is for quite a few us, then, if survival matters, and it does, then adaptation is the key. In the era of rapidly evolving media, repackaging fails, because repackaging is not adaptation. journalism (no matter how hit and miss those flawed human beings actually implement those principles). More and more that includes “the people,” “the public”, the “ordinary citizen” with mobile phone cameras, tweets and blogs–who actually report rather than rant. So using this analogy, evolving media will bring that progress in the arts and sciences (forget about socialist culture, at least as it existed in the 20th century) but over a longer time scale than the quarterly results report period so beloved by the financial markets. The first primitive angiosperms probably appeared sometime in the first age of dinosaurs, the Triassic, about 200 million years ago, but had little impact, perhaps evolving in isolated areas or islands, until (at least according to the current fossil record) 100 million years ago, there came some sort of tipping point and there was the explosion of flowering pant species from the tiniest flower to great new deciduous trees. Consider the Internet, the Web, Facebook, Twitter, Foursquare, phone and tablet apps, the new flowers, as part of an media ecosystem undergoing rapid evolutionary change, with more to come. 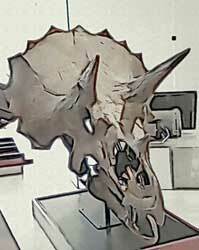 The large scale appearance of flowering plants then triggered evolutionary changes among animals, insects,birds, dinosaurs and quite likely mammals. So it is inevitable there will be new “species” of journalists emerging now and in the coming years. In the short term, the prognosis for the news media is not that good. The world is in economic turmoil, and the financial and corporate sectors, trapped in mid-Twentieth century models that no longer work, are failing to adapt. Governments are also failing to adapt to escalating challenges. As for the media, the corporate level is also trapped in mid-Twentieth century models that no longer work. On the level of the actual news story, the media workers, the ecosystems are also in turmoil, those Cretaceous new flower species are spreading through the ferns and conifers, and crowding them out. In the long term, I am optimistic for the future of real journalism, the kind that tells significant stories about people and events, and for those who “commit journalism,” whom ever they may be. After all, the emergence of those first significant flowers 100 million years ago, led eventually, to William Shakespeare writing in Rome and Juliet, “a rose by any other name would smell as sweet.” The disappearance of some of those fern and conifer species led to fields of beautiful flowers and trees with juicy apples. Some form of journalism will survive even a probable crisis of climate and civilization, just as life, including flowering plants, eventually recovered from the impact of the asteroid that shattered planet Earth 65 million years ago. So imagine that someone far in the future is producing a documentary about the media crisis of the early 21st century, modelled on the dinosaur epics, first pioneered by a public sector broadcaster the BBC, and now a mainstay on Discovery and National Geographic, especially during the November sweeps. 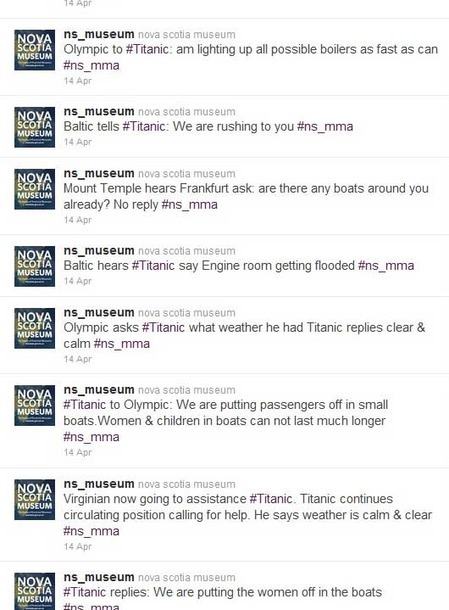 First the weather forecast, so beloved by media consultants. Over the coming months and years, unsettled, with storm warnings and sunny breaks. Long term outlook, increasingly volatile weather and climate patterns. The transnational media, giant trees that dominate the landscape today are threatened by the tiniest of creatures, call it a tweet. This is not unlike another climate and evolutionary disaster of the early 21st century, in British Columbia and elsewhere in the west, the pine beetle’s destruction of the forests. Thanks to climate change, most winters are no longer cold enough to kill off the pine beetle the voracious insect flourishes as it eats its way through and destroys the forest, pine tree by pine tree. The tiny 140 character tweet may be the media equivalent of the pine beetle for the giant, often consultant run, stock market directed media corporation. 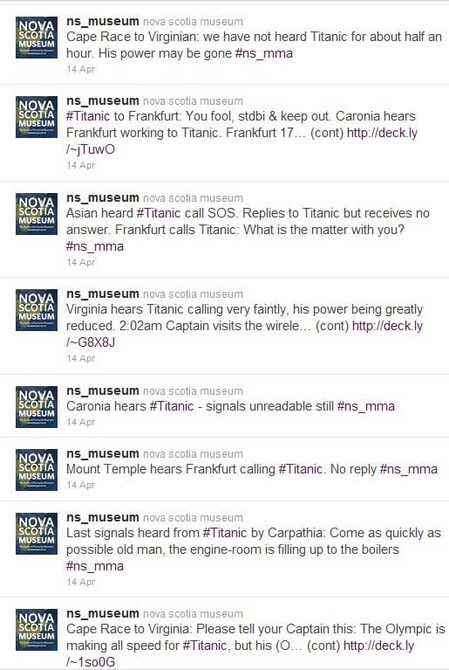 News breaks on Twitter, most often from tiny BNOnews or a wire service, sometimes from another big news organization and occasionally from a citizen. If the story is significant it is immediately retweeted and picked up by the wires and those 24/7 satellite and cable news organizations that still actually cover news rather than airing screams. Yet, sometimes as much as eight hours later, network and local TV will blare “Breaking News” and turn off an audience that already knows all the details of the ancient story from Twitter. CNN was a real news organization, meant “stop, look and listen . Now, Breaking News has become so much a cliche that we see actors portraying phony reporters covering “Breaking News” Boxing Day sales for furniture chains. No matter what, unimaginative TV news operations insist on continuing with the same old pitch. Some corporations never learn. Now we see overuse of the Twitter alert for routine news stories, even when the same news organization has Twitter accounts for the routine. That overuse only diminishes the brand and all the public has to is unfollow the overused alert. So the great apex trees, weakened by tiny enemies, crash in the raging storm. The sun comes out and with the overhead canopy gone, at least temporarily, new species and existing adaptive species reach for the sun and thrive. So new species are filling the ecological niches freed by the decline of the apex media tree. Like small animals and plants, the hyperlocal species are the first to take advantage of the new space. Some of those species will thrive, others will be driven to extinction by a failure to truly adapt to the new conditions. Species that once thrived in the apex canopy now have to adapt to the new environment, creating competition for existing niches (as for example, when laid off or retired photojournalists create new competition for existing wedding and commercial photographers). 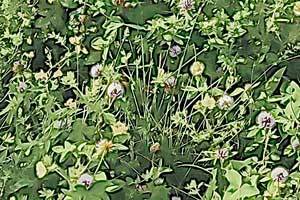 Just as the rise of the flowering angiosperms created new niches and become aggressive invaders, the media environment is facing newly evolved and perhaps more adaptive species. One aggressive invasive species is Wikileaks. Wikileaks enters that investigative niche largely abandoned by the increasingly too specialized apex media species. Like other invasive species, Wikileaks, also disrupts the ecosystem. 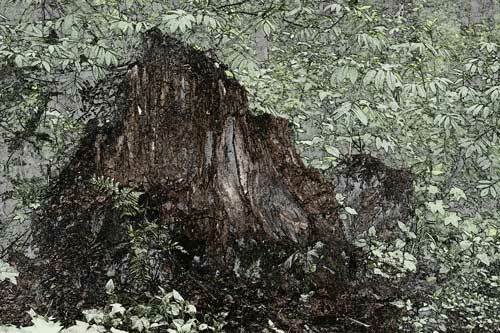 Wikileaks is not the same kind of species Again imagine a tall and solid investigative fir tree, now old and rotten. 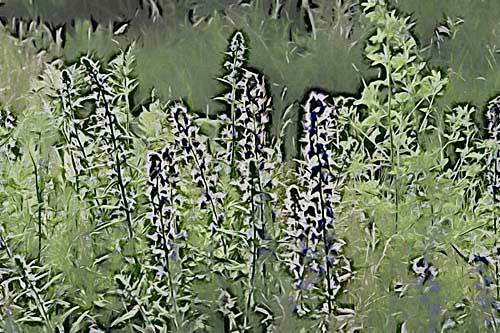 Wikileaks, perhaps, it is too early too tell, is the media ecosystem equivalent of kudzu or purple loosestrife that fills the place emptied by that fallen tree. Another example is where one established species takes advantage of a gap in the ecosystem, in this case Jon Stewart, who provides news on a comedy show in a way that many young people, and some of their elders, consider more credible than the main stream media. It was only Jon Stewart who raised the despicable hypocrisy of the Republican party’s filibuster on the bill providing assistance to 9/11 first responders in New York, which lead to the article in the New York Times comparing Stewart to Edward R Murrow. Some journalists objected on Twitter and blogs to the comparison, but if the major news media had not abandoned the investigative niche, in some ways pioneered by Murrow, among others, if the networks and the major newspapers had covered the story, that comparison with Jon Stewart would not have been raised. (At least in the entertainment environment, another new and aggressive species is Netflicks, which is perhaps a more efficient distribution system that traditional broadcast television and cable . 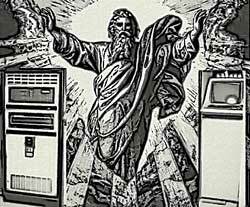 Or multi-terabyte tablets and phones will destroy broadcast television as we know it, at least for entertainment, but that could free bandwidth and air time for more news. 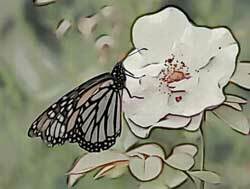 On the other hand, one species which flowered briefly and then disappeared was the colourization of movies. The old black and white films still play on speciality channels while the colourized ones are not often seen). One example is the rise and now possible fall of the content farms like Demand Media. Demand Media takes advantage of search engines and the sudden availability of staff (warm bodies from the dying main stream media) in the media ecosystem to create quickly produced, cheap and superficial content. 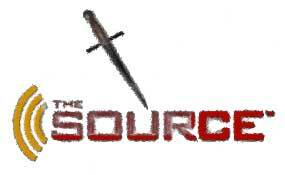 The Demand Media content appears on search due to taking advantage of Search Engine Optimization. That superficial content, however, clogs the system, and brings complaints from the public, users who are looking for substantial content, who complain to Google, which in turn rewrites its search algorithms to emphasize quality content and downgrade the content farms. In this new ecosystem, the person in the right place in the right time with a mobile phone, still or video camera, the citizen tweeter and some bloggers, the citizen journalist joins the ecosystem. Nothing is certain. If the tablet is a new ecosystem, some of those media species who have a symbiotic relationship, with the tablet, games and books, are thriving. The adaptability of newspapers is, at the moment, uncertain. Given the figures at the end of 2010, magazines appear to have flowered briefly and now are withering and the question is will the magazines adapt to the new tablet environment? Why can’t many of the big media corporations adapt? 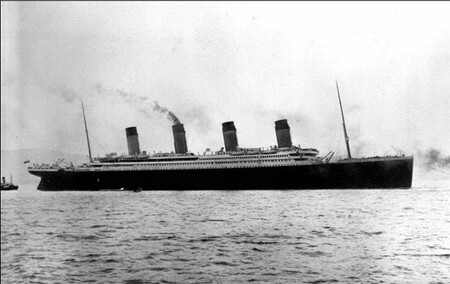 Once corporations took real risks, sending ships to out to the end of the world or building transcontinental railways (often with government support). Or in the case of the media, sending reporters to fascinating places to find fascinating stories at home and abroad. Today the companies, especially media companies, perhaps have evolved to be too highly specialized, often an evolutionary dead end, few making true long term, evolutionary investments. To use a climate analogy, the modern media corporation is like a species that is adapted to four seasonal nutrition opportunities, the quarterly earnings report. Most of corporate worker bees have one reluctant aim, to make sure the queen and the drones are well fed and get their bonuses even if the company is bankrupt. The media climate is changing, results from four seasons are no longer reliable. Now, more adaptive, omnivorous species are entering the ecosystem, more able to adapt to the changing, volatile climatic conditions. So whether it’s a freelance on a shoestring, a hyperlocal effort, a small tech start up, one of the last family owned newspapers, a giant private sector corporate media chain or a public broadcaster, the solution to survival is to understand that there will never be a return to the equilibrium of twentieth century media. A technical innovation will come out of nowhere just at the moment you believe when you’re all caught up. 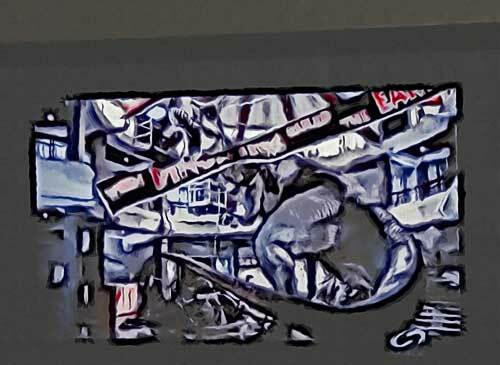 The trouble is that the large corporation is too often eager to simply make the newest innovation, as one online pioneer commented to me, “part of the big machine,” and thus the machine, part of the old ecosystem, stifles true innovation. The race will start all over tomorrow and tomorrow and tomorrow. That “new media” may become part of the system, it may last a year, it may last a decade, or may be replaced in six moths. Think evolving media. Whether you are 22-year-old entrepreneurial multimedia independent or the 70-something CEO of a giant media corporation you must work on evolutionary time line. By evolutionary I mean adaption and survival. That means you have to eat today to see tomorrow but you must also (perhaps like migratory animals) think beyond the horizon, rather than hoping the next season will bring some extra goodies. Some hints (and it will be painful for the executive class, but then everyone else has been working with pain for the past few years, so why shouldn’t the executives?). Put some of your budget aside for contingencies a decade ahead and also budget for shorter term unexpected technological innovation. Keep moving the decade date ahead and refreshing the budget as the years go on. Prepare and budget for investing in complete utter and total failures. Prepare to understand that no one is to blame for a technology that looked good one year and flopped the next. That is the way of the world today. Don’t look for scapegoats in executive row, the IT department or your staff geeks. Move on. Stop following the crowd. Remember the 60s. “Do your own thing,” see what works and what doesn’t for you and your audience. Again be prepared to fail and fail again. Chances are you will actually succeed. Do follow the crowd once a critical mass is apparent on the horizon. 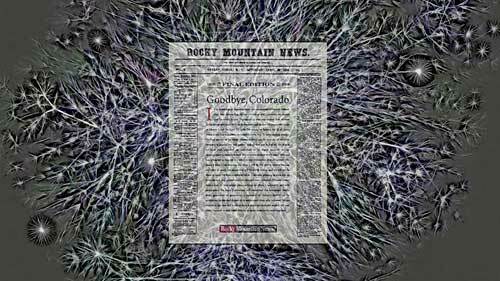 In the 1990s, many news organizations hesitated to jump on the web. Those companies paid for their mistakes, some never really caught up, for others it took a decade or more, all forgetting he who hesitates is lost. Most news organizations were quick to recognize the potential of Twitter, but once again those who got on Twitter early now dominate. 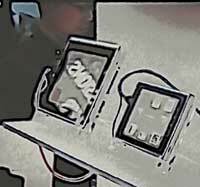 The tablet, no matter what form it eventually evolves, is the delivery system of the coming years. 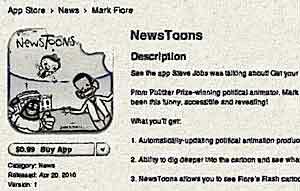 There are still far too few good, well-designed news apps out there at the moment and the audience is already gravitating to those that are available. Trust your own people. In 30 years in “new media” (wherever I worked) I was told time and time again by know nothing managers to attend a session with an expensive consultant only to find out that our staff usually knew more than the consultant. In 90 per cent of cases, consultants are a waste of time and money. In ecosystem terms, consultants are like epiphytes, air plants, that look good, often with pretty flowers, on a tree branch or trunk but are essentially parasites, living off the tree itself. If you want your staff to listen to the latest guru, pay for them to attend a conference where they can get the same canned speech at a much lower cost, and may find an even better idea in a small seminar or a corner booth. Look for adaptability, not age. Innovation goes in cycles. Your best assets are those who are/were working at a time of innovation and were early adopters at that time, whether they are now 20, 40 or 60. One large and well known news organization is notorious for an unofficial policy in their future planning meetings for excluding staff over the age of 40, believing the under 40s would have the new ideas. Unfortunately while many on the committees were part of one or another digital generation, had grown up with the web, most came on board during relative technological stability and so hadn’t faced the problems of instant adaptability and innovation. At the same time, the youngest staff, in their early 20s, and many of whom are part of a new innovation cycle, had already been laid off in last hired, first fired, short sighted cost cutting policies. So the “planners” proceeded to reinvent the wheel and make costly mistakes their ignored elders could have warned against, while not embracing the new tech that the lost 20-25 year olds were already using. The editorial assistant, the intern, the “cub reporter,” is your newest asset and a crucial long term investment. Last hired, first fired for younger media employees may have worked during a temporary downturn in a relatively stable environment, but in this time of rapid change it is, for any company, self-defeating standard operating procedure foolishness. The “kid” answering the phones knows more about the stories “younger audience” wants than all those consultants you hire. 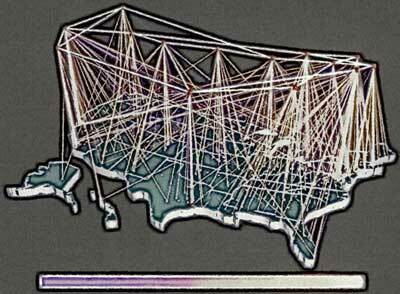 The recent purges of editorial assistants by many major news organizations, as a short term cost saving measure, is just one example of the corporate media’s blind evolutionary decline. Revolving unpaid internship after unpaid internship, the cruel uncertainty facing many young people, is another indicator of the long term spiral into decay. If disillusioned young people drop out while the energetic ones strike out on their own, there a fewer and fewer fresh ideas that can renew and revive your moribund main stream media. Compete and cooperate at the same time; just as ravens and wolves, both predators, often cooperate in the hunt and then compete for the spoils. The 19th century newspaper barons in New York who founded the Associated Press were fierce competitors and at the same time knew when to join forces to make sure all their customers would get news, something that today’s over specialized, short sighted and self centred media barons forget as they pull out of wire services and other cooperatives. Respect the eco-audience. The audience, which supposedly is all important to the media, is part of this ecosystem. The media largely ignore the hard fact they and the “audience” are part of one integrated landscape. Instead, the metrics obsessed media relies far too much on marketing and demographic surveys and studies from the fantasy worlds created by many economists. That current reliance, the audience narrowed again and again by the corporate bean counters, increasingly excludes more and more of the public. That deliberate exclusion is one of the roots of the current distrust of the media. That exclusion creates a feedback mechanism, the more people excluded for business reasons, the more the wider audience even in the demographics demanded by the advertisers and sought by the media, distrusts the media and drops out or goes elsewhere (for example the huge American audience for the reliable reporting in the Guardian online). By all means watch the latest tech shows, like the BBC’s Click. But also sit back and watch one of those dinosaur shows on a science channel, and imagine yourself in one of those changing, evolving changing ecosystems and then plan your media business accordingly. 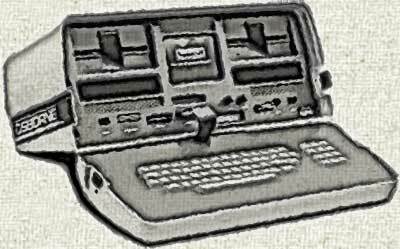 The old adage from the earliest days of computing, Garbage In Garbage Out still holds. The beleaguered news industry is obsessed with metrics, too obsessed in my view. That obsession also seems to be based on the idea that the data being gathered is good data, not junk. Yet this week, up popped on my iPad a sad example of what is wrong with the efforts to save journalism, sad because it comes from one of the United States’ most respected journalism schools. 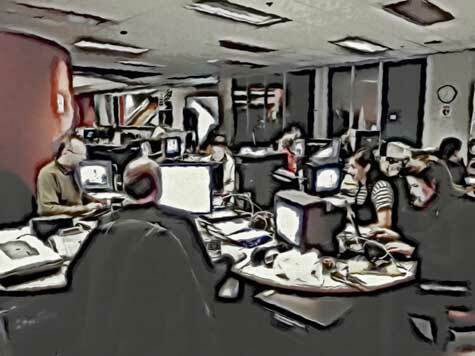 It is a survey, a survey that shows just how out of touch with reality some studying the future of news are, a survey that is so seriously flawed that when I was teaching journalism at Ryerson University in Toronto, in the 1990s, I could have used as an example to teach students what to avoid. When I lived in big cities, and being part of the generation raised on print, I would devour the morning paper along with my breakfast, mostly the Globe and Mail in Toronto, but in the various other cities I have lived, also the Ottawa Citizen, the Times and the Guardian in London, the South China Morning Post in Hong Kong, the Vancouver Sun and The Province. Now, in Kitimat, British Columbia, there is no newsprint waiting on my doorstep at dawn. So there I was Saturday morning, scanning the Associated Press app, when there appeared at the bottom of the screen, a very enticing ad. Since I am interested in shaping the future of news, I tapped. 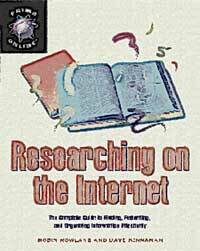 The first page was both a further enticement and the usual academic disclaimer needed when surveying human subjects. The survey was from the University of Missouri School of Journalism, one of the best institutions south of the border, so I was quite optimistic. There were warning signs. The disclaimer added a further enticement for ongoing participants, but only to Americans, saying that to win the goodies, an iTunes gift card, you had to be United States resident over 18. I am interested in shaping the future of news. So I tapped. The first screen came up. My heart sank. The first question asked for the subject’s five digit US zip code. That meant immediately that everyone outside the United States didn’t count. I filled in the field to let me see if I could continue. I could, but now the survey has no idea where I’m from. So much for shaping the future of news. Here’s the first problem, just the day before the ad popped onto my iPad, on Friday, October 22, the Wall Street Journal reported. Morgan Stanley estimates that about 13 million Apple tablets will be sold this year, out of 15 million total tablet sales world-wide. For 2011, Morgan Stanley estimates that Apple’s number will rise to 30 million, while non-Apple tablets will skyrocket to 20 million. So assuming the figures are correct (and if you check these other links, the Morgan Stanley figures appear to be in the right ball park), 15 million people around the world use tablets at this moment. Associated Press, even though it is based in the United States, is a world-wide news organization with staff, stringers and affiliates in every spot on this planet. Even if a lot of those 15 million users don’t read the Associated Press app, you must assume that the majority of the people get their news from their tablet and many use multiple news sources. 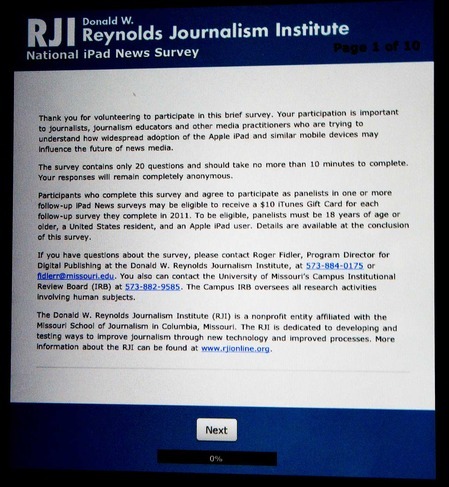 So how can a genuine survey aimed at shaping the future of news exclude the majority of iPad users? When I worked for CBC.ca, (which unfortunately doesn’t yet have a news app) our audience figures showed consistently over the years that 20 per cent of our web audience came from the United States and another 10 per cent of the audience came from the rest of the world. The BBC site has a huge world-wide audience, and I can only presume that is reflected on the audience figures for the BBC app on the iPad. More Americans are now reading the Guardian than read the Los Angeles Times. This readership has found us, rather than the other way round. So as a Canadian, I sighed, it looked like just yet another case of American exceptionalism and parochialism. The next question asked the birth year of the participant. 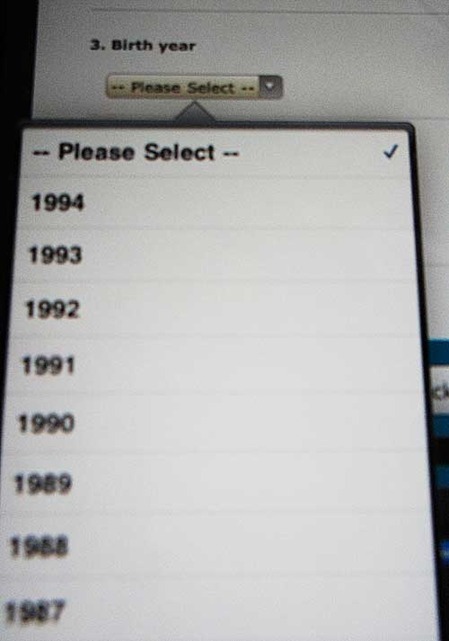 But the drop down menu stopped at 1994, excluding everyone younger. So why the exclusion? I wondered for a moment if it was the US law where for many internet activities magic age is 13. So if so, the survey is still excluding three years of users. Or one must ask is it something to do with the giveaway of the iTunes gift card, rules set by who. Apple? A university ethics committee? The state of Missouri? The state of California? Then why not 18​? 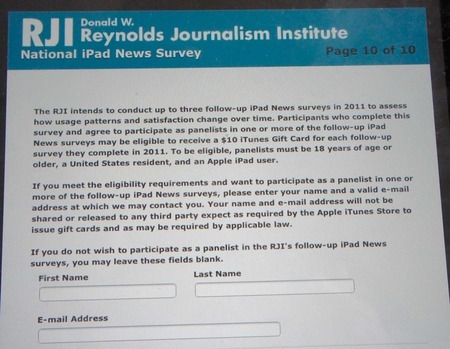 Are these giveaway rules skewing and distorting the survey? One more note, about the United States resident restriction, especially if it is tied to the giveaway. Again it conflicts with what we do know about web journalism and probably tablet journalism. That people who move away keep in touch with local news by checking hometown web sites and often that it is a huge part of a news site’s web audience (even if the corporate side is reluctant to point it out to local advertisers). So once again this survey is excluding all those American ex-pats around the world who may be reading the AP and New York Times apps. And what about all those members of the American military deployed overseas, most of whom technically are not on US soil, checking their local news on tablets? Do they count? Finally, while the questions were fairly routine, asking about how I consume news on paper, on my smart phone and in my iPad, I detected a bias (or perhaps over simplification) in the questions. It may be an urban bias, despite the fact that the University of Missouri in is in the heartland of a largely agricultural state. (I was at Missouri for a beautiful August week in 1993 when I attended IRE computer-assisted reporting boot camp). 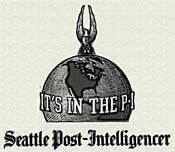 There was no way I could tell the survey that journalism on paper is not as available in the far Pacific northwest as it is in downtown Toronto, New York or St. Louis. It assumes an almost “either or attitude,” that the one reason you give up a newspaper on paper is to switch to electronic delivery because you just love your iPad. Yet there are other reasons, for giving up reading papers on paper. A lot of the more environmentally active refuse to read paper (even though the electronic versions are probably just as bad for the environment). As mentioned, for many people today, your home town paper isn’t delivered in Kandahar or Kuala Lumpur or Kingston-upon-Thames. There is also a second factor, it is much easier to read a newspaper on the way to work in a city with a good public transportation system, where you can read the paper on the bus, subway or train. So how much has commuting habits to do with consuming news on a smart phone or tablet? But this is clear, with the crisis in journalism, this type of survey is not a help, it’s a hindrance. If it’s American parochialism, same old same old will continue to fail with a world-wide audience and increasing world-wide tablet sales. If it’s the iTunes giveaway setting the survey parameters, it’s a bad as any survey that is paid for by a corporate sponsor with a pre-determined outcome. If it’s because of a lack of budget due to current restraints that make it impossible to crunch numbers from 15 million tablet owners, then the survey should have been done like someone like Pew who can look at the planetary picture. Garbage in, Garbage out has no place in shaping the future of news. NOTE and UPDATE: I can get Canadian news, via The Canadian Press (an organization I occasionally string for) via the AP app on my Android smart phone. But the Local News function on the AP Ipad doesn’t work, My Ipad insists that I live in Manhattan, not Kitimat.